Top: One of the historic buildings at the former Royal Observatory, Cape of Good Hope, (now the headquarters of the South African Astronomical Observatory) after which the area is named. Middle left: Groote Schuur Hospital. Centre Middle: A World War I monument in the centre of the Neighborhood. Middle right: Cafes on lower main road in Observatory. Bottom: A view of Observatory's soccer and hockey stadium looking towards Devil's Peak. 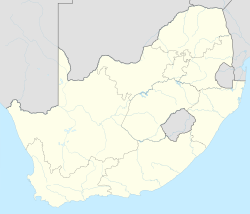 Observatory is a suburb in Cape Town, South Africa that is bordered by Mowbray to the south, and Salt River to the northwest. Known affectionately as Obz, the area is best known as a student neighbourhood, most of the students attending the University of Cape Town located close by. It is also the home of the South African Astronomical Observatory headquarters as well as Groote Schuur Hospital. The suburb of Observatory is situated on the north-facing lower slopes of Devil's Peak. The slope runs into the Liesbeeck River and, as such, much of present-day lower Observatory was a marshy estuary formed by the rivers, where buffalo, hippo, elephant, zebra, jackals, antelope, lions and leopards were once prevalent. The Raapenberg Bird Sanctuary protects 10 hectares (25 acres) of land along the Liesbeek River. Modern-day Observatory traces its origins to the Koornhoop Colony land grant issued in 1657. Between February 1657 and February 1658, fourteen free burghers were granted land by the Dutch East India Company along the Liesbeeck River valley. The then Governor of the Cape, Jan van Riebeek, decreed that a fortified building called “Fort Coornhoop” be built as one of several small forts to protect against the Khoikhoi. Part of what was developed as Koornhoop became Uitwyk, which is now known as Malta Farm. The name is derived from the location and construction of the Royal Observatory, Cape of Good Hope in the area at 33°56′7.13″S 18°28′38.47″E﻿ / ﻿33.9353139°S 18.4773528°E﻿ / -33.9353139; 18.4773528﻿ (SAAO) in 1820. The Royal Observatory in Observatory, Cape Town, houses the McClean Telescope. The building was designed by Sir Herbert Baker and was completed in 1897. The original buildings now serve as the headquarters of the South African Astronomical Observatory, with an on-site museum exhibiting various historic instruments and telescopes. During the years of apartheid, Observatory was one of the few de facto 'grey' suburbs where all races lived together. On the evening of 30 December 1993, three men entered a popular student venue on Station Road, called the Heidelberg Tavern and opened fire, killing four people and injuring five. The three APLA operatives - Humphrey Luyanda Gqomfa, Vuyisile Brian Madasi and Zola Prince Mabala - were convicted in November 1994 for what became known as the Heidelberg Massacre. On the 16 July 1998, the Truth and Reconciliation Commission granted the three amnesty. It continues to be a somewhat alternative part of town, with 'New Age' style stores, South Africa's only anarchist infoshop, and several programmes at the Observatory Community Centre. It is served by Observatory railway station on the Southern Line, with regular trains every 40 minutes or so, and every hour on Sunday. Observatory is the location for much of the short-term accommodation used by increasing numbers of overseas, particularly North American and European, students attending UCT. Observatory is a great place for dog owners. The suburb has some fantastic dog walking facilities along the river bank, a well maintained dog park  as well as many poop bag dispensers, maintained by OBSID along the roads. The roads are quiet and there are always a few dogs and their owners out and about. The suburb's proximity to the University of Cape Town (UCT) and its Medical School in particular, has always made it popular with students and lecturers. Observatory has long had a vibrant entertainment scene, as a result of its high proportion of students. [original research?] There are numerous restaurants and bars, with a high turnover, but some long term stayers. Most restaurants and retail shops are located along Lower Main road. There is also a shopping complex in St. Peter's square, which is located opposite Groote Schuur graveyard. Observatory has many churches. The Anglican parish church of St Michael and All Angels, designed by Sir Herbert Baker and the only one of his churches completed to his design, is widely recognised as a bastion of Anglo-Catholicism within the Anglican community of South Africa and has a strong choral tradition. Observatory has a soccer and hockey stadium below the station, Hartleyvale Stadium which is flanked on one side by Liesbeeck Parkway and on the other by Willow Road. In this section of land, there is also an outdoor swimming pool that is popular on summer afternoons – between the two there's a circus school. A driving range and nine-hole golf course is housed at the River Club. There are several civic movements in the suburb. The longest serving is the Observatory Civics Association (OCA) that liaises between the local residents, organisations, businesses and the City of Cape Town. The Observatory Civics Association is a member of the Greater Cape Town Civic Alliance. The OCA worked with the City of Cape Town to upgrade the Village Green and relocate the World War II memorial from the N2. In November 2009 the Observatory Improvement District was launched to enhance the suburb with better security and cleansing. The Observatory Improvement District covers almost all of the suburb below Main Road. In 2010, walking and cycle paths were established on the western side of the Liesbeek River. There are two birdwatching hides on the river, one in the grounds of the South African Observatory, and one in the grounds of the River Club. Beyond the astronomical observatory is Valkenberg psychiatric hospital, a Victorian heritage building  that has recently undergone extensive renovations. Valkenberg houses the mentally ill in secure accommodation, as well as providing out patient care. Beyond Valkenberg is a small hotel, and the Wild Fig restaurant. The Victorian Groote Schuur Hospital looms over the suburb, and is the hospital where Professor Chris Barnard performed the world's first heart transplant, on 3 December 1967. This event is the theme of the Heart of Cape Town Museum, located at the hospital. As with most of South African urban spaces, crime is a problem, with burglary and muggings as well as minor vandalism and graffiti. In the past decade there were several murders, however security has now improved with active local civic participation. A pioneering community security organisation, Obs Watch, ran bicycle patrols for years, but became defunct. In 2006 this was formally replaced by the Observatory Neighbourhood Watch, and this intervention has made a significant impact on cleansing and safety in the suburb. Large CCTV cameras have been erected at most of the exits and entrances to Obs. ^ a b c d "Sub Place Observatory". Census 2011. 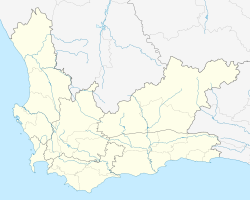 ^ "Cape Town – Southern Suburbs". Maps Info South Africa. Retrieved 25 September 2010. ^ "History of the South African Astronomical Observatory". 2013. Retrieved 22 June 2014. ^ "Invaders received a lesson in warfare". www.iol.co.za. Retrieved 8 March 2019. ^ "Dovecot, Koornhoop, Dixon Road, Mowbray, Cape Town". 8 August 2012. Retrieved 22 June 2014. ^ "The History of Observatory". 31 May 2008. Archived from the original on 23 June 2008. Retrieved 17 August 2008. ^ a b "History of the South African Astronomical Observatory". South African Astronomical Observatory. 1995. Retrieved 16 January 2012. ^ "Heidelberg massacre: Story of reconciliation". 15 December 2009. Retrieved 22 June 2014. ^ "AMNESTY GIVEN FOR HEIDELBERG TAVERN MASSACRE". 16 July 1998. Retrieved 22 June 2014. ^ "SIMON`S TOWN - WYNBERG - CAPE TOWN" (PDF). 2010. Retrieved 21 June 2014. ^ "Map of organisations". Retrieved 22 June 2014. ^ "Coverage Map". Retrieved 22 June 2014. ^ "Official gazetting of heritage status" (PDF). Retrieved 22 June 2014. ^ "Observatory Neighbourhood Watch Amended Constitution" (PDF). Retrieved 22 June 2014. Wikimedia Commons has media related to Observatory (Cape Town). This page was last edited on 25 March 2019, at 17:57 (UTC).